Before I moved the U.S from Canada, I lived in Grande Prairie, Alberta in 1997. I remember spending a long weekend in Jasper National Park with my future wife. We were completely awestruck at the natural beauty of it. Even though we were there for three days, I kept telling myself that I had to make the trip back and spend even more time there exploring the riches that the place had to offer especially Banff. The following year, we had the opportunity to move to the states. As expected marriage, busy careers, and a costly divorce put my plans of going back on hold. At times, I wondered if I would ever go at all. Some twenty years later me, my girlfriend, and her two kids are leaving Calgary International Airport heading for Canmore - the gateway to the Canadian Rockies. For her and the kids, it would be their first time seeing mountains. Even though it's early afternoon, I'm wiped out. The combination of trying to sleep on a cheap air mattress, being at the airport at 5:00 AM and the stress of flying, I try my best not to be irritable. We head across the prairies and halfway to Canmore, the mountains appear in the distance. I still remember the first time I caught glimpse of the Rockies and I was in awe at the size of them. The sight of them brings a smile to my face and that irritability starts to go away. My girlfriend's kids are teenagers and as expected, there's no ooh's or ahh's. They look up and go back to their phones. My girlfriend comments how impressive they are. The transition from prairies to the boreal forest is pretty abrupt and the hills are covered in deep green and the mountains get bigger and bigger as we approach them. The Trans Canada highway hugs along the mountains and it goes through the valley and along Lac des Arcs. Some of the mountains are practically right next to the highway. We all strain to look up at and see the tops covered in snow. We arrive in Canmore and pull up to the inn where we're staying for the night. Our trip is being split in two, as tomorrow we're leaving for Vernon BC to see my mother and sister for four days and then heading back to Banff on Thursday morning and fly back Saturday afternoon. Time is limited and I'm notorious for trying to cram everything into the less amount of time possible, I would be the nazi tour guide from hell. A place this huge, the sense of time can be quickly lost. 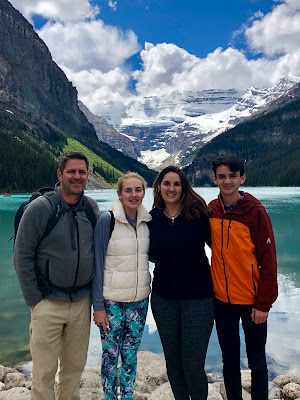 Proir to the trip I've been trying to plan on what to do and how much can I possibly squeeze in without the kids having a meltdown. Also, I have to be mindful that my girlfriend suffers from a chronic illness. We haven't even unpacked and I'm starting to get antsy. The town is located 50 miles west of Calgary along the Trans Canada highway. 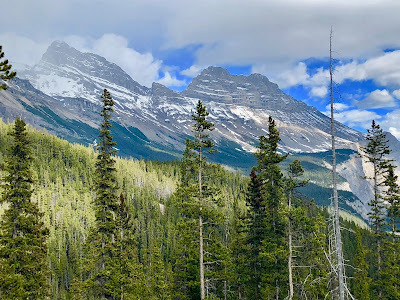 It's southeast of Banff National Park and is part of the Kananaskis Country. The population of the town around 13,000 and was once known for coal mining, but mining operations ceased in 1979 and the community converted itself to a tourism-based economy after the success of the 1988 Winter Olympics. Since then the town has tripled in size and has become a popular tourist destination during the summer and winter months. The area is also a very important wildlife corridor as many species move through the community and into and from the park. We pull into the Windtower Inn and it has a Swiss village feeling to it. Canmore has become a popular place because lodging is cheaper as in most cases, half of what you would spend in Banff. During the summer months, Canmore is the only option when Banff's hotels are booked to the max. We booked our suite for $150.00 for a night way back in January. The suite was small but cozy. There was a full kitchen, washer and dryer, and a pull out bed. This would have been the perfect base to explore the park if we had stayed the entire week. The drive to the Banff isn't far, only 20 minutes and there were several provincial parks close by. We unpacked and I looked for a place to eat as we hadn't had anything since we landed in Minneapolis earlier in the morning. I found a Greek restaurant named Patrinos close by. Since the weather was nice, we elected to sit out on the patio. The patio was located right next to the railroad and over the tracks, there's a strip mall. In the distance, there were the 3 sisters as the locals call them. The mall did ruin the ambiance of the mountains when I tried to take pictures. 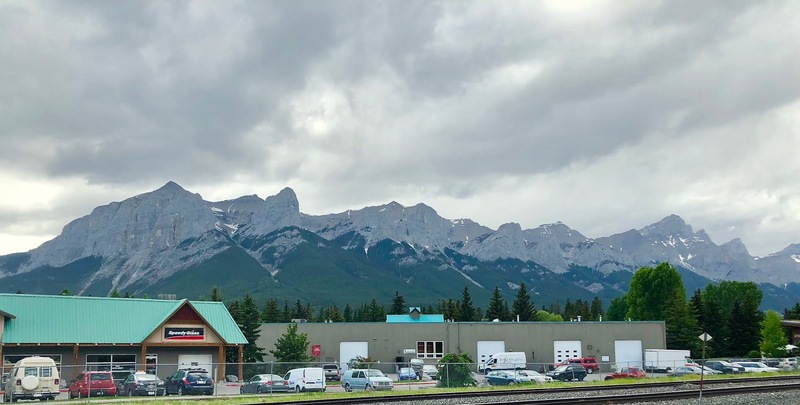 In recent years, Canmore has struggled with growth, while trying to preserve the natural beauty of the area. 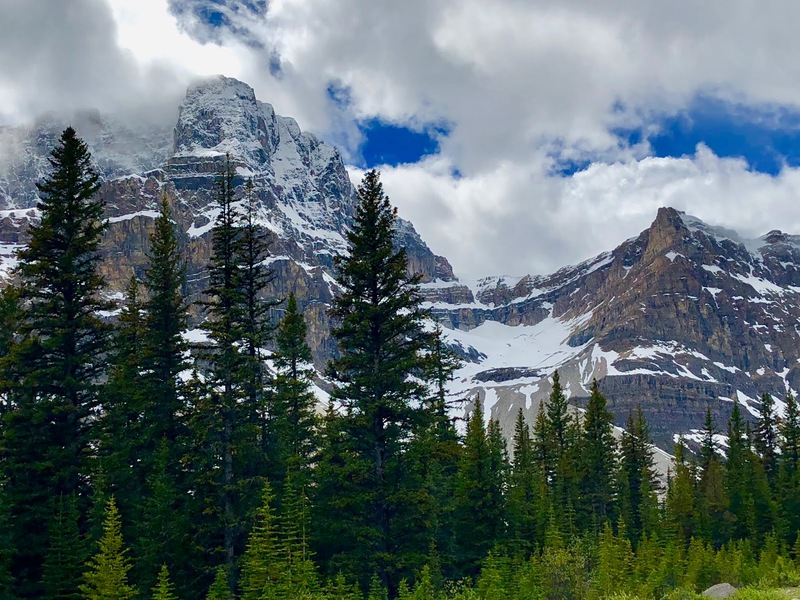 Some people feel eventually it will suffer the same fate as Banff, a place jammed packed with hordes of tourists, tour buses and lack of space. Dinner comes quickly and I wolfed my down quickly. There's a schedule to keep and we skip dessert. Even though it's only 5:30 PM and it doesn't get dark until 10:00 PM, there's a lot I want to get done. The plan was to do the Minnewanka Lake Loop, Vermillion Lakes and then head over the Upper Hot Springs for a much needed soak. We get in the car and head for Banff. Prior to the trip I paid for a park pass and printed it out, as I didn't want to wait in line. However, there wasn't much of a line when we drove by. 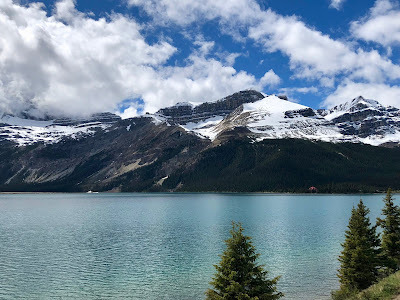 The Minnewanka Lake loop is one of the best places in the park to see wildlife. 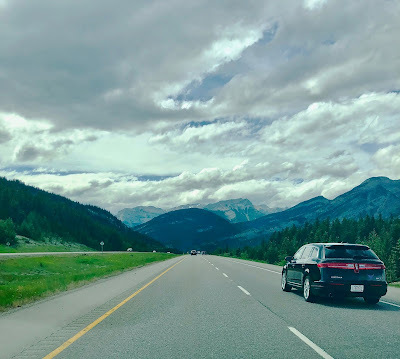 Ideally, I would have liked to do the Bow Valley Parkway, but the park shuts it down after 8:00 PM to allow wildlife to move around as most of them are still moving to spring and summer haunts. If we had gone later in the month, the nightly road closure would have been lifted. The Minnewanka Lake loop is about 13km in distance. The loop offers a wide variety of activities for the tourist such as hiking, mountain biking, canoeing, and camping. It's also very close to the town of Banff. 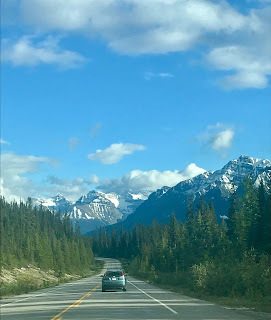 We get off the exit to Banff Ave and head north and follow the signs to the loop. The loop goes along the Two Jack Lake and western end of Lake Minnewanka and loops back to Banff Ave. Immediately, in the distance I see an elk out on the meadow, unfortunately, I can't pull over and it's too far away for pictures. The road is narrow and winding as I try my best to keep an eye out for wildlife and on the road. We see absolutely nothing. We pull off at Two Jack Lake for a photo op. Even though it's the weekend, we're the only people there. To the south, the clouds are covering the top of Mount Rundle. The wind coming off the lake is chilly. I take the opportunity to take a picture of Kim and the kids. The shots are great as I have the snow-covered peaks and the forest in the background is deep green against the rocky background. The mountain air is refreshing as I just stand there and take in the view. 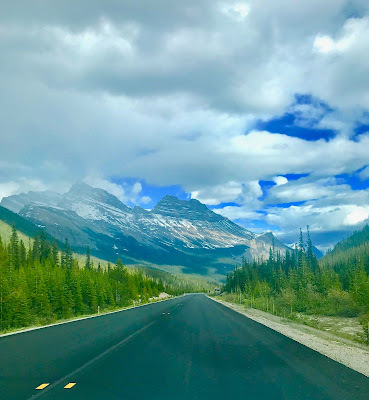 We get back on the road and head towards Lake Minnewanka. As I'm driving, I see something in the distance walking up the road. I quickly recognize it as a bighorn sheep. Sheep are one of the most common mammals in the park. They often frequent the sides of the roads feeding on the lush growth before heading up into the mountains in mid-summer. The sheep is completely comfortable with the car stopping right next to it. Across the road are two others feeding on the hill. We take some pictures and continue on the loop. We come up to Lake Minnewanka which in Natoka means "Waters of the Spirits". We drive over the dam and see some boats out on the lake. The lake is very popular with boaters and scuba divers. The first thing that pops into my head is how good is the fishing? It's a shame that I won't have any time to wet a line. Farther up and around the road we see a couple cars stopped along the side. I glance over and there are two elk feeding. It's hard to see them because they're down in the bushes. We can't pull over, but the kids get a glimpse of them. Hopefully tomorrow, we might see more of them when we head up the Bow Valley Parkway on our way to BC. Before heading into Banff, I turn on to Vermillion Lakes road. Along the road, there are a series of small lakes. 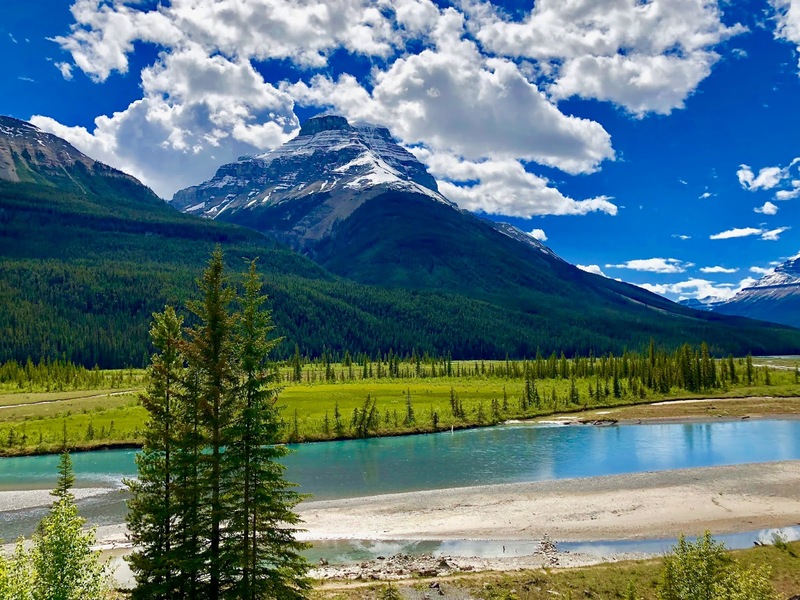 The main attraction of the lakes is the stunning view of Mount Rundle. I slow down to scan around the lakes to see if there are any animals. I don't see any, but I do see evidence as there are several trails in the reed beds were either made by elk or deer. I park the car and we get out to take some pictures. I take several photos of Mount Rundle and Sulphur Mountain. I also take some shots of the lakes and the surrounding forest. They look peaceful and serene despite hearing all the traffic as the Trans Canada highway runs right behind us. The lakes are popular for canoeing and paddle boarding, but nobody is out this evening. The only animal we see is a muskrat leisurely swimming along. We see several people with large cameras on tripods. What are they waiting for? I have no idea, but I hope they have a lot of mosquito repellent as it will getting dark in a couple hours. We leave them behind and head into Banff. When it comes to the town of Banff, opinions about it vary widely. You either love it or hate it. I'm in the hate it camp because it's become so commercialized much to the detriment of the town. During the "shoulder" season, the number of people can be staggering as is the traffic. The downtown core is a wide collection of cheesy gift shops, restaurants, hotels, outfitters, high-end stores, and cafes. I have no intentions of shopping and shelling over money as the entire town is a tourist trap. As a foodie, I'm intrigued to see what's there to offer, but that will have to wait later in the week. When we turn off from Vermillion Lakes road, we see the huge Banff sign. As expected there's plenty of tourists vying for spots to get their pictures taken in front of it. Banff Avenue is the main street that takes you in the downtown core. Along the stretch, there is one hotel after another and they all share one thing in common - no vacancies. The sidewalks are packed with people and every parking spot is taken up. I would expect that for a Saturday evening and I can't imagine what it will be like July and August, which is considered prime tourist season. The hot springs are located outside of the town. We cross over the Bow River and follow the signs to Sulphur Mountain and the Upper Springs. One of the main attractions in Banff is the gondola ride up the mountain. At the top are an observation platform, two restaurants, and a gift shop. Both I and Kim discussed taking the kids up it. But, the $220.00 price for the four of us to ride eight minutes up was a little ( no pun intended ) too steep for me. I didn't want to pay in advance because the weather here can be unpredictable as tickets are non-refundable. When we arrived, the temperature was dropping and higher up it was probably even colder. The gondola is clearly one of those tourist traps that the locals warn everyone about. We head into the hot springs and I pay $30.00 for four and four towels. We get changed and I and Kim's son head out to the pool. There's a sign telling people that the pool's current temperature is 39C. The pool is packed with people and I get a somewhat queasy feeling as I don't like getting into pools with a large number of people for obvious reasons. The water is hot but refreshing as I get in and there are Kim and her daughter. In the pool, I hear a large collection of accents and languages spoken. You can tell who's European, especially the men when they get out and they're in a tiny speedo and their gut is hanging over it. After a long day of flying and driving, my aching muscles and body need it. I just sit at the edge, soak and people watch. After an hour, my body starts to prune as does everyone else. It's starting to get dark and I'm tired as we've been up since 4:00 A.M Eastern time. Back home it would be almost midnight. As we walk back to the car, I look up and the skies are getting ominous. I hope the weather is good tomorrow morning. We get back to the inn and I hit the pillow hard. Much to the chagrin of others, I'm snoring within minutes. I wake up early and peek outside, the clouds are low and it's raining. The tops of the mountains are cloaked in them, giving them a mystical appearance. I know the drive up Bow Valley Parkway would be a waste of time as wildlife generally don't move about when it's wet. Both me and Kim head down for breakfast and let the kids sleep in. The plan is to get them up and hit the road for BC because the weather isn't great for anything. Once the kids are up, I pack up the car and we're on our way. Unfortunately, most of the mountains are obscured by the clouds we go through Yoho and Glacier National parks. The weather is miserable pretty well all the way to Vernon, so much for sightseeing. Thursday morning we leave Vernon early and the weather there the entire time was cool and cloudy, with the odd break of sunshine. I look at the weather report for Banff and it's not as great as they're calling for rain for the remainder of the week. But the weather in the Rockies can turn at a moment's notice. The drive is deary and uneventful until we get to Revelstoke. The clouds start to break and the sun comes out. We catch a glimpse of the higher peaks as past through Glacier and Yoho. Sensing that the weather will be to our advantage, I make the decision to go straight to the icefields. On the way to Alberta, the traffic on the opposite direction of the Trans Canada highway is awful. Cars and trucks are backed up for miles as construction season is in full force. The government of BC is committed to twinning the highway. That's a huge task considering the terrain. If the traffic was bad on a Thursday, I can't imagine what it would be like tomorrow. 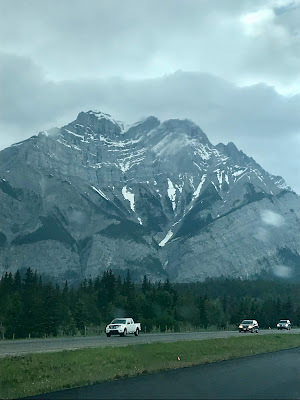 We cross into Alberta and see the exit for the Icefields Parkway. 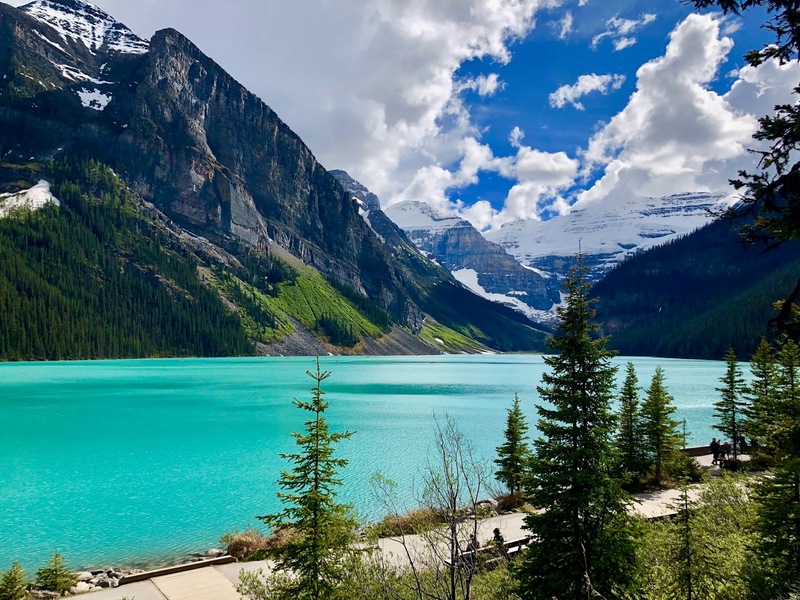 There are several places that I want to see such as Peyto Lake, Bow Lake, any wildlife along the road and the big one is the Athabasca glacier. The first stop is Bow Lake which happens to be right off the parkway. We pull off and there are a few people mingling about taking in the scenery or snapping pictures. Bow Lake is about 30-minute drive north of Lake Louise. It's one of the largest lakes in Banff National Park and sits at an elevation of 6,300 feet. The lake is fed by meltwater from the Bow Glacier. 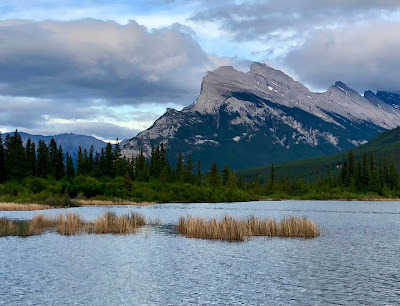 The centerpiece of the lake is Crowfoot Mountain as the some of the clouds touch the top of it and swirled about. The snow glistened from the sun and the water had that beautiful turquoise blue. 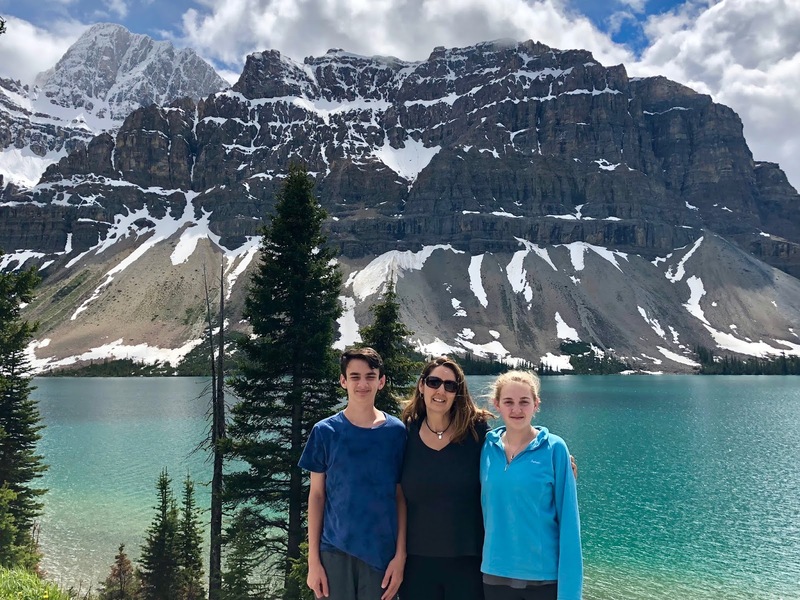 I gather Kim and kids and get a great shot of them and the lake and the mountain behind them. We continue our drive north and we see another small lake along the parkway. We decide to stop there on our way back. 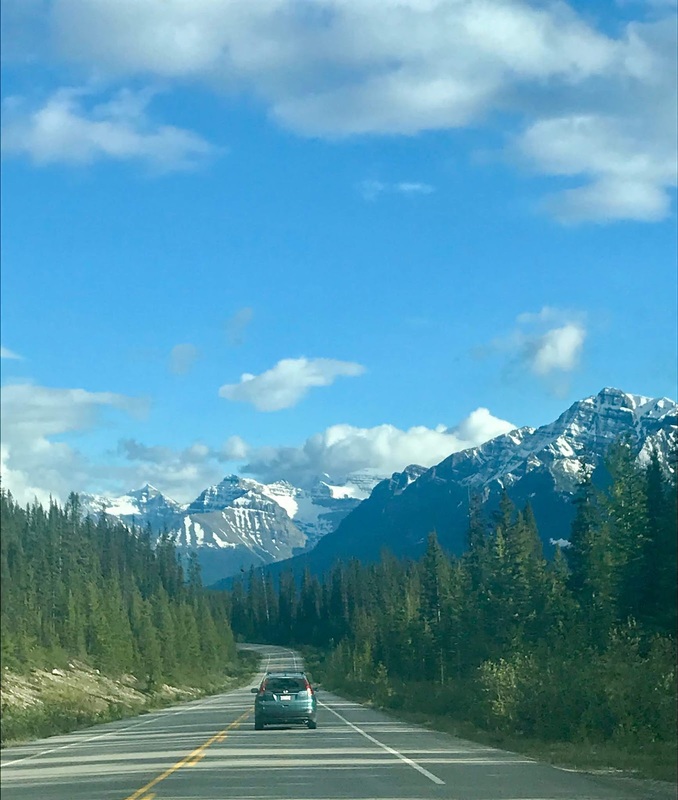 The Icefields Parkway stretches 144 miles through the heart of the Banff into Jasper National Park. The journey offers easy access to a vast wilderness of broad valleys, lush forests, glaciers and pristine alpine lakes. The parkway is very smooth and wide shoulders to allow motorists to pull over and take pictures or view wildlife. With all of the beautiful scenery, one can lose time trying to get everything done in one day, which I had to be mindful of. The other thing that I wasn't mindful of was the amount of fuel I had left in the car. I filled up in Vernon and I checked to see that I was under a quarter tank left. That was enough to make me break into a cold sweat because there's no cell phone service and there's only one gas station at the Saskatchewan crossing. The gas station is full service and when I see how much its per liter, my jaw drops as it's $1.99 per liter. I convert it to U.S gallons that pretty well $8.00 per gallon. I wisely tell the kid to fill it halfway. But since it's the only gas station between Lake Louise and Jasper, they can charge whatever they want. I look over at the RV next to me and I can't imagine what he's going to pay. I ask the kid how far is it to the Athabasca glacier and he tells me about 50km. The next stop is a beautiful lookout of the North Saskatchewan River. 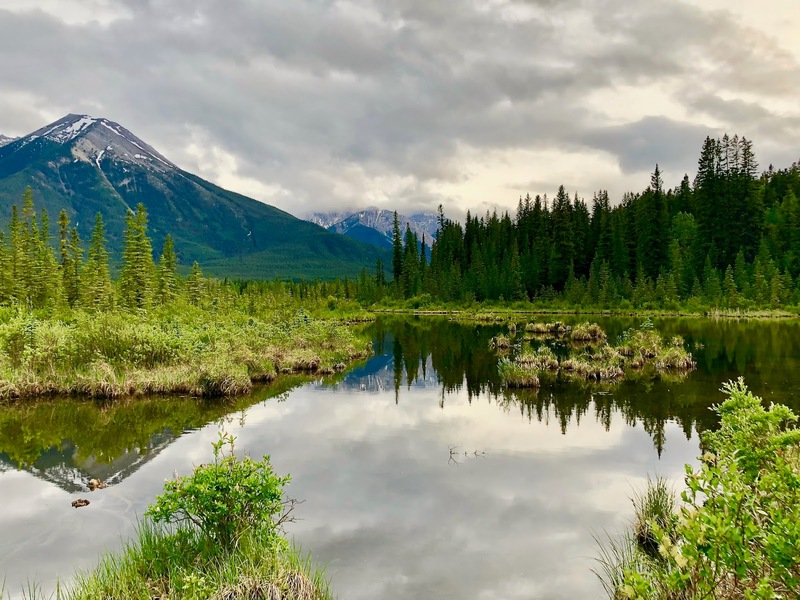 This is the headwaters of the river as goes from here and flows nearly 800 miles across the provinces of Alberta and Saskatchewan. From the viewpoint, the water looks stunning. I look at the river and wished I could wet a line. 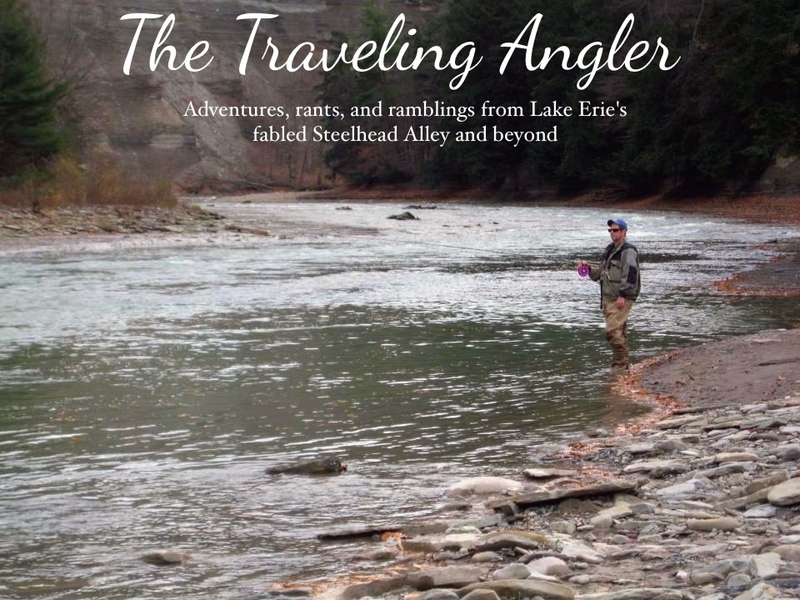 There's plenty of lakes, rivers, and streams for the avid angler to fish. We don't stay long, just enough time to take some pictures. We continue north and along the valley and I can see the parkway make a long hairpin curve and up along the side of a mountain. The car revs as I climb up along it and there are a couple pull-offs that offer a spectacular view of the valley below. The parkway continues up the mountain and we're very close to the glacier. Ahead we see the Columbia Icefield Visitor Center and pull in as the kids need to use the bathroom. We get out and walk to the center and the first thing I notice is the terrible stench of diesel from the countless number of tour buses idling in the parking lot below. Inside it's a bustling place as people are heading out the skywalk or buying tickets for the ice bus. Once again, I see it as another tourist trap and I have no desire to shell out a lot of money to walk out a glass bottom walkway or drive on to a glacier for a couple hundred dollars. The kids come out and we drive out to the glacier. 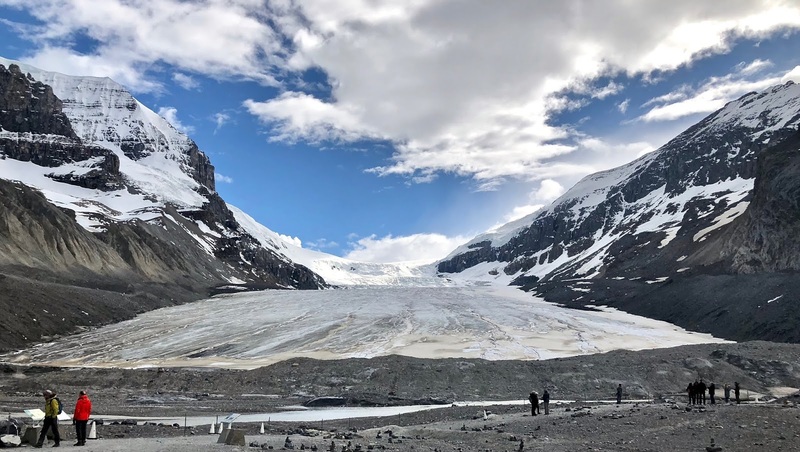 The Athabasca glacier is most accessible and visited glacier in North America. We park at the closest lot to the glacier. Despite being June we bundle up as the wind coming off the snow and ice is cold. I do chuckle at the sight of Kim's daughter wearing her Crocs as she walks effortlessly over the rocks. The surrounding area looks like a moonscape as there are rocks scattered about. I look down and see the grooves where the glacier over thousands of years has worn down the rocks. We finally make to the edge of the glacier and it's truly impressive. The park has roped off access to it for a good reason as several people have died when they walked out and fell into crevices. We all stand there and take in the sight of it. I couldn't imagine the looks on the faces of the first explorers when they view it. Back then in the 1800s, it was more impressive looking. I look at the sides of the two mountains and I can make out where it once was. The park has erected placards on the location of the glacier over the decades. 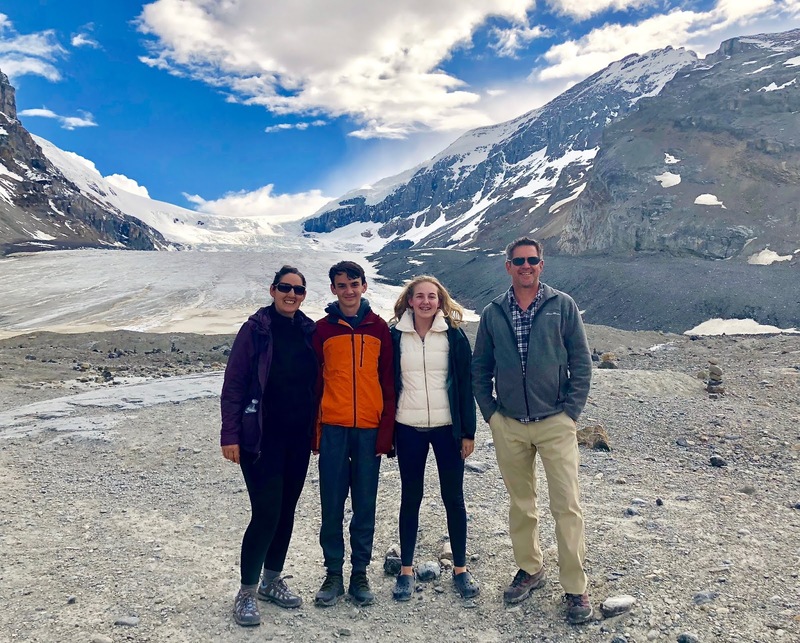 The glacier is currently receding at a rate of about 16 feet per year and lost over half of its volume in the past 125 years. The recession of it is staggering considering 125 years in geological time is a nanosecond. The placard from the 1800s is located off the highway and is quite a distance from the glacier's current location. I tell the kids that its possible it could disappear in their lifetime. I notice the time about 6:00 PM, we've been on the road since 9:00 AM and the kids are probably getting tired of being dragged around. We get back and start heading back to Banff. Along the way, I want to stop at that little lake which I found out is named Waterfowl Lake and the last stop will be Peyto Lake. Before heading down the mountain, we stop at that pull off and take pictures of the valley. 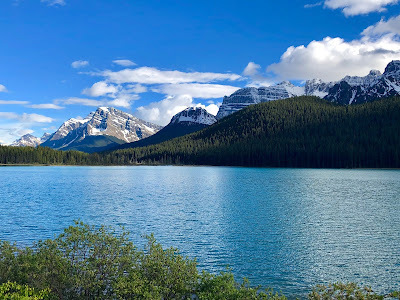 We stop at Waterfowl Lake and I get some great shots of the sun hitting off the sides of the mountains. On the way down the parkway, we get a special surprise as a lynx crosses over. Unlike other animals, the lynx doesn't stop for a photo op and quickly heads into the forest. Lynx is a rare sight, considering they're secretive in nature. 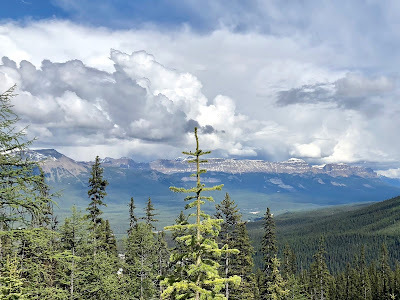 As we drive south, we're looking for Peyto Lake. On the way up we didn't see any signs posted along the highway. We had a map and it showed the location. But we can't find any signs on the way back. The kids are getting crabby and we decide that they've had enough of the Rocky Mountain tour for one day. I'm disappointed, but I understand that kids don't have the threshold that I have. 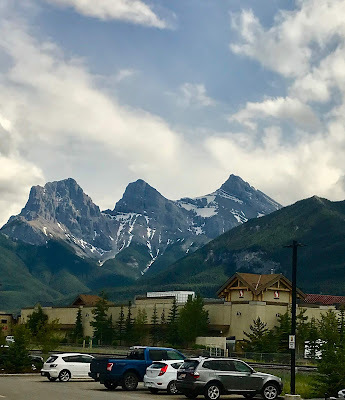 We make into Banff and check into the hotel. The place we're staying at is the Inns of Banff. When we're looking for lodging we picked this place, because it was inexpensive. However, $250CDN I would expect something more appealing and maintained. Unlike the last place we stayed at, we enter our suite and I'm not impressed. The room is very outdated and the carpet resembles something you see used at a mini putt. The floor squeaked with every step. The furniture had scratches and didn't match the room. Inspection of the bathroom revealed worn grout and the tub looked old. When one of the kids took a shower they complained that the tub was too slow in draining. The walls were paper thin as we can hear everything in the hallways and the room next to us. At least the beds are comfy and I'm dead tired. I'm out before Kim tells me good night. Friday morning comes and it's our last day in Banff. We have a lot to do today. I get everybody up and we head out for breakfast. I picked a place named Tooloulou's because they have a massive breakfast menu. Tooloulou's is a Creole/Cajun themed-restaurant located on Cariboo street. We walk in and immediately get a table. I look at the menu and I know what I want, a meal packed with carbs and protein for a day of adventure. I get the New Orleans Breakfast skillet. The skillet is bursting with 2 eggs, 2 sausages, back bacon, home fries, grilled tomato, 1 pancake and a buttermilk biscuit. Kim and the kids get much smaller dishes and after eating my entire skillet, I start scavenging the kid's pancakes and home fries. With an almost bursting stomach, we start our adventure. 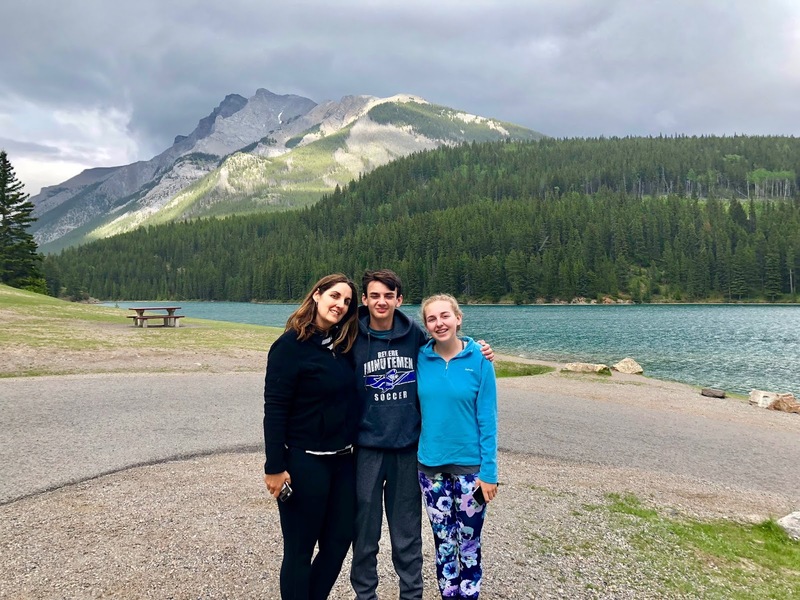 We take a drive up the Bow Valley Parkway in hopes of seeing some wildlife. Before entering, Parks Canada has a spot check to see if motorists have a park pass. We get the thumbs up and head north. The weather is decent, but I do wish it was earlier. It's a little past nine in the morning. I specifically look for areas that have meadows or clearings. Since it's early summer, many of the herbivores are trying to pack on the weight they lost during the winter. We drive by a prescribed burn and there's nothing. I purposely pull over to allow other cars to go by. The only thing we see are five mule deer. Back in Ohio, we have plenty of deer so the kids aren't thrilled. We continue to drive and I slow down around meadows only to see nothing. The same can be said at Moose meadows, but I recently read that moose are pretty well absent from the Bow Valley. I'm getting frustrated because I everyone to see a bear. However, there will be none this morning as we get off the parkway and head towards Lake Louise. 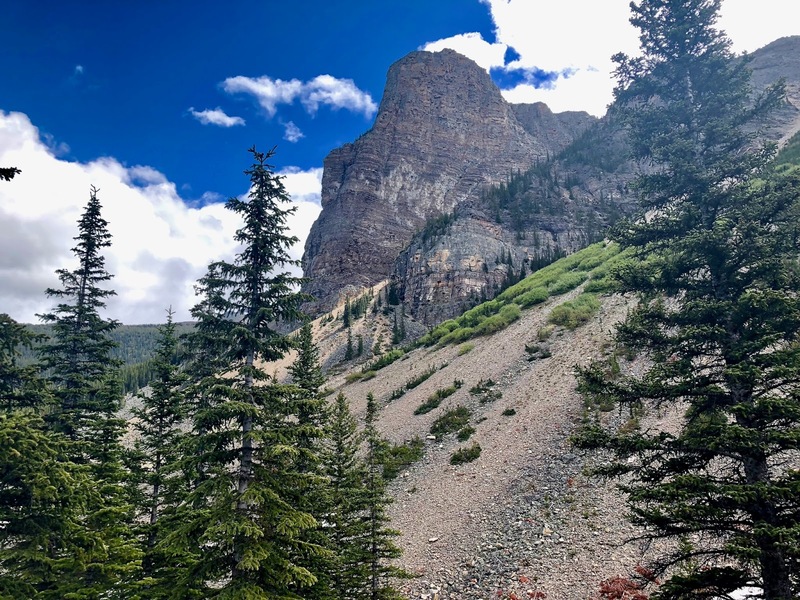 Driving along I noticed a large sign along the side of the road says Moraine Lake is open and immediately pull on to the road. I remember reading that parking at the lake is very limited and once the parking lot is full, the road can be closed for extended periods of time. If that's the case, people have to take a shuttle from Lake Louise. Wanting to take advantage of that, I tell everyone we're heading there first. The drive is 11km and the road twists and turns. At one section we see the effects of avalanches as the road to the lake is closed during the winter months. As we get closer the road runs precariously close to a cliff and we see the valley below. Finally, we see our destination, Moraine Lake. The parking lot is indeed small. Probably lucky to fit 50 cars and the rest of the spaces are RVs and buses. We have to drive around three times before finding a spot. We walk to the lake, I see the Moraine Lake Lodge, which I happened to look at but was put off by the $800 per night price. At the end of the lake, there was a huge rock pile and I encouraged the kids to cross over the logs jammed in the stream. There were several kids climbing on the rocks high above. My balance isn't the best so I elected to walk around the back and left Kim watching her kids. I climb up the steps, up towards the observation area. 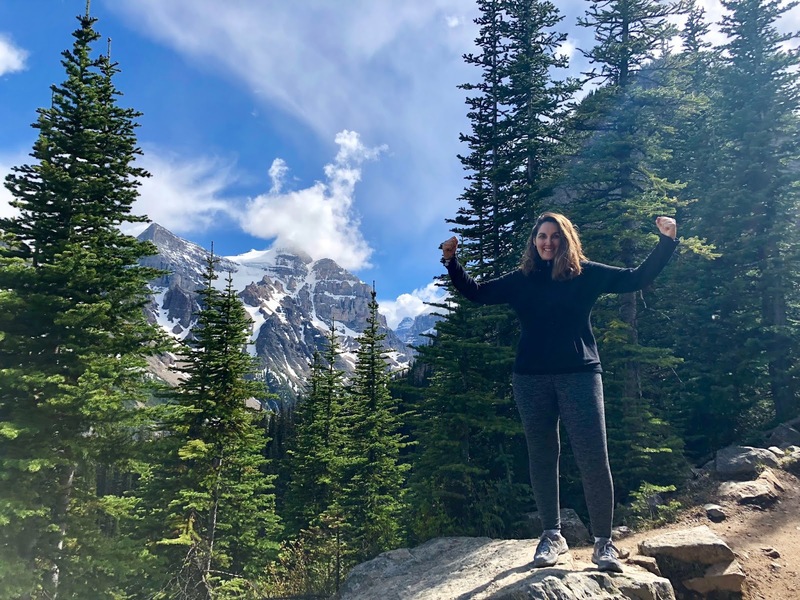 When I reached the top, I was completely awestruck at the scenery, the Valley of the Ten Peaks. The lake is a glacially fed and does not reach its crest until mid to late June. When it is full, it reflects a distinctive shade of blue. The color is due to the refraction of light off the water from the glacial flour being deposited in the lake from the meltwater. Usually, the lake doesn't get that color until July and August, but due a warmer spring, the snow melted quicker and despite being early June, the color was magnificent. Then add in the Ten Peaks and the photo opportunities were priceless. The peaks were majestic in stature and color. The image of the peaks and the lake are iconic in Canadian culture as they were on the backs of the 1969 and 1979 twenty dollar bills. The clouds roll above some of the peaks and I'm taking a lot of pictures. I head back to get Kim and when I get there I see the kids start heading down the rock pile. We all head up and I take a group picture of them. All of them are impressed with the view. 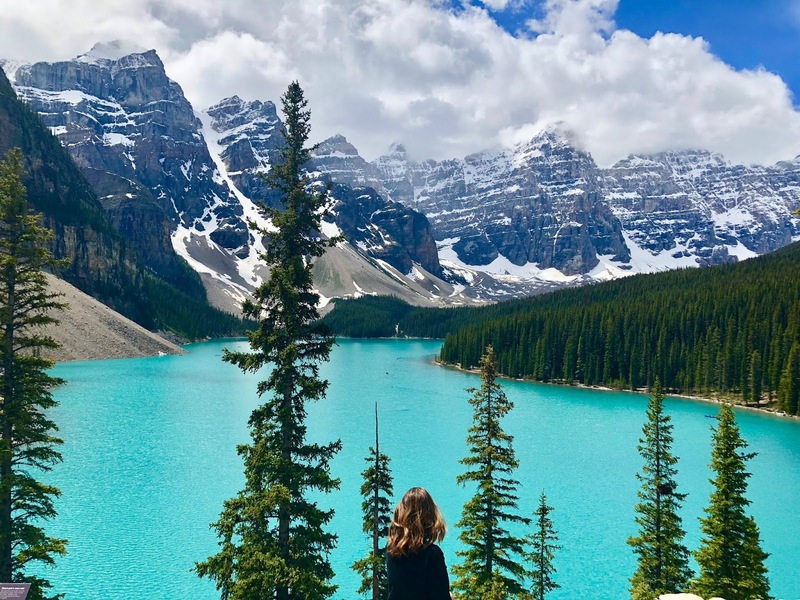 Personally, I think Lake Moraine is one of the most scenic places in Banff. Before heading out, we enter the gift shop and the place is full of clothing and trinkets. Usually, I resist buying stuff from places like that because I think it's way overpriced. The kids have money from their grandparents and Kim and her kids all buy the same red Canada hoodies. I chuckle at the cheesy notion of seeing all of them wearing the same outfits. They egg me on to buy one and I dryly reply "We're not the Griswolds". We're off to Lake Louise and the teahouse. It's not a far drive once we get off Moraine Lake road, taking only a few minutes. By the time we get there, it's early afternoon. The parking lots are full as we have to park on the upper level. We head down and I see the Fairmount Chateau, the iconic filthy expensive hotel on the shores of the lake. Here you can be shelling out well over a $1000 per night for certain rooms. The shoreline in front of the hotel is a bustling place of people taking pictures. A lady is nice enough to take our pictures and I return the favor for her and her family. We immediately head towards the trail that leads up to the teahouse. The trial was full of people when we started. It was a perfect weather for hiking as it was cool and partly cloudy. The distance from the shores of Lake Louise to the teahouse is roughly 2.2 miles. 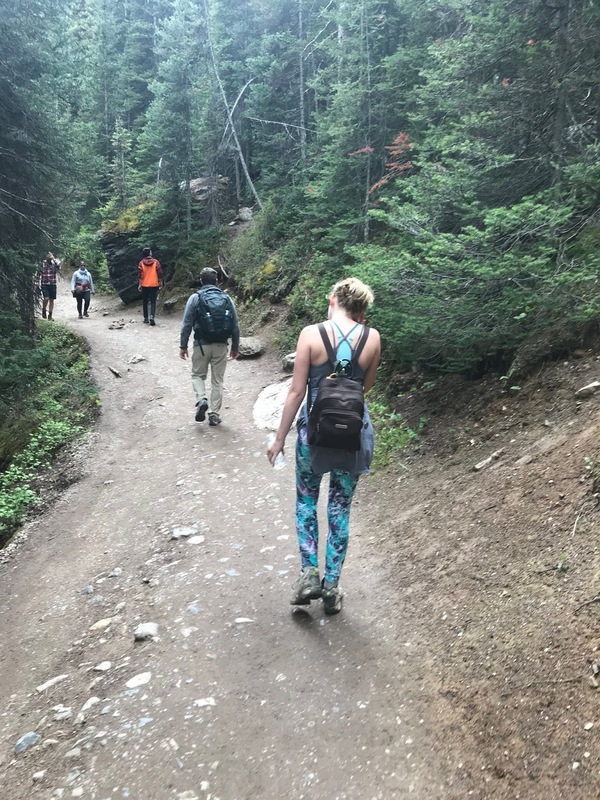 According to the park, the trail rated moderate and should take depending on your fitness level 1 to 2 hours. The elevation gain is 1,312 feet. The trail was narrow but dry and well maintained. As you climb the trail has a series of switch-backs. My concern was my girlfriend as she has postural orthostatic tachycardia syndrome also known as POTS and this would be a test for her. She wanted to do it and pacing was the key as was carrying a lot of water. 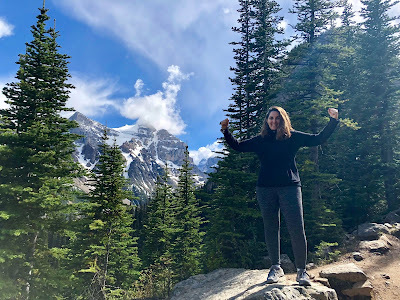 Prior to heading to Banff, she got a saline infusion that would help elevate the symptoms, especially in an area of high altitude. We took our time as Kim had to stop a couple of times to rest as her heart rate went up. Even with the cooler temperatures, I was working up a sweat. I was the pack horse as I had a backpack full of water, food and some clothes. There was more traffic heading down as it was it getting close to mid-afternoon. The trail continued to switch back and forth and I wondered if we would ever get there. Finally, I could see the big beehive and there was a sign for Mirror Lake. We stopped at the lake, to catch our breath. The lake is very small and clear, I smirked at the no fishing sign posted in front of the lake. Above the lake was the big beehive, the rock formation did have a resemblance to a beehive. There's a trail leading from the teahouse that gets you to the top of it. With Kim's condition and two teenagers, which one of them dislikes hiking, beyond the teahouse, would be pushing past their limits. We climb the last stretch and see the stairs. Right next to the stairs is a small waterfall that spills down into the valley below. We make it up the stairs and there's the teahouse. The house was constructed back 1901 by the Canadian Pacific Railway as a refuge for hikers. We find a table outside and the weather is getting colder as clouds roll in and showers begin. We look at the menu and the tea list is extensive. There's also sandwiches, soups, and bread. Hot tea and soup would hit the spot. The waitress comes out and takes our order. Unfortunately, the soup of the day is sold out. We order a kettle of maple blueberry tea, peanut butter and jelly sandwiches, banana bread, and a turkey sandwich. The teahouse is cash only and I had $40.00U.S which I thought would be enough. I was short by $5.00 and Kim had enough to cover the rest. Prices are expensive because everything is either hiked up or flown in by helicopter. As expected the food and tea hit the spot. After eating, we hang out at the lake and take some pictures. In the distance, I hear the loud high pitch calls which I thought might be pikas. The calls are coming from the rockpile where pikas prefer to live. I venture over to investigate and found out the calls are actually ground squirrels. Far across the lake, I see some several people hiking up to the top of the beehive or the Plain of the Six Glaciers, where there's another teahouse. I wished we had more time, but it's getting late. The hike down is easier and the scenery is breathtaking. I take pictures of Kim standing on a rock with the mountains in the background. She triumphantly holds her arms up and flexes them as a sign of victory that she made up to the teahouse. Many people with POTS wouldn't have been able to do that hike. We finally make it down and both Kim and her daughter race for the bathroom. I stand around and look at the lake. Tomorrow we head back and I feel a sense of sadness that our time has come to an end. There's so much more I wanted to do. The evening is spent packing and the kids are exhausted. They went through a lot, being in the backseat for hours and going from one place to the next with no breaks. I could have been harder on them, but Kim cautioned that it would be too much. A part of me wished we could have stayed another day and headed back Sunday. But the kids had to be at summer camp that day. Saturday morning we check out and head back to Tooloulou's for breakfast. The weather is gloomy as the clouds are low and it's raining. 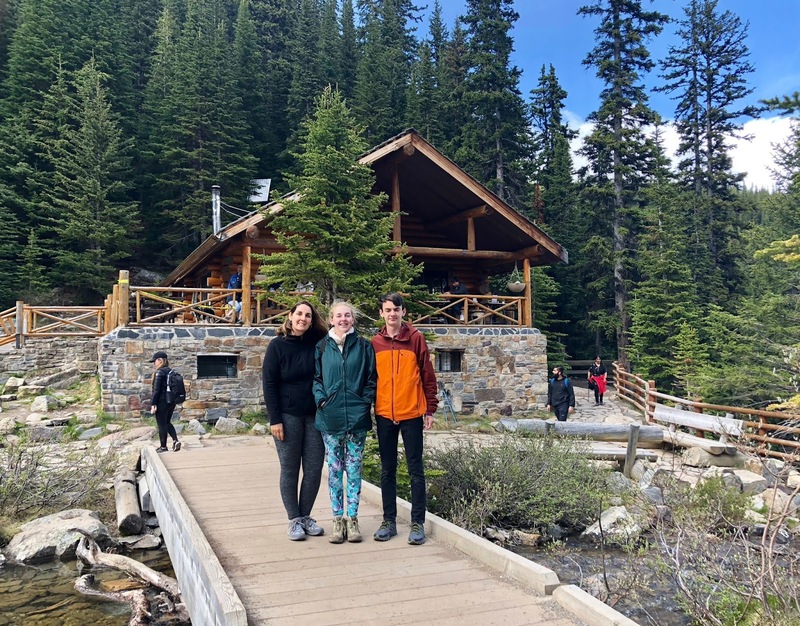 I do find it amusing that they're all wearing the same outfits they bought from the gift shop at Moraine Lake. The kids are looking forward to summer camp to be with their friends. I, on the other hand, get one day to rest and its back to the grind. We hit the road and say farewell to Banff as we head for Calgary. The mountains eventually give way to the prairies and we see the Calgary skyline in the distance. The vacation was a success, even though the weather wasn't ideal. We did a lot in the little time we had there. As we wait for our flight, I look at the pictures I have taken. I have a surprise for Kim when we return as she'll be moving into her new home later in the week. I pick out several pictures of her and the kids and I'm going to have them developed and framed as a house warming gift. 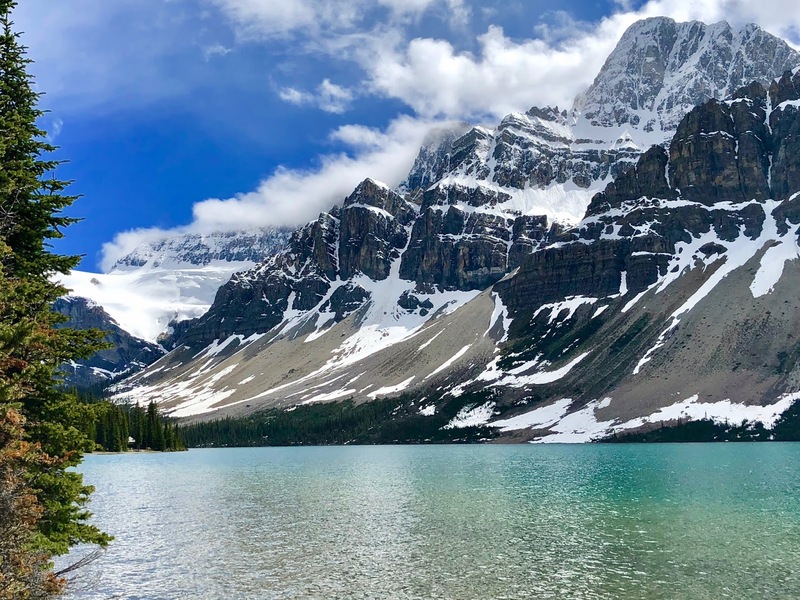 I thought of it several days ago, when I took pictures of them at Bow Lake. I have no idea if either of the kids will ever have the opportunity to come back. 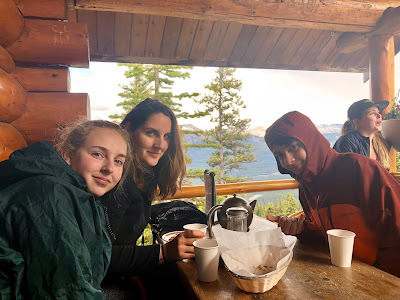 But I want them to cherish the time with their mother, who has had a rough past couple of years with her chronic illness and a difficult divorce. Our plane takes off and I see the last images of Calgary as we head for Minneapolis. We land two hours later and there's a two and half hour layover. I'm bored sitting around and anxious to get home. I look outside and I wished we go back to Banff as there was so much I wanted to do. Imagine the things we could have done there if we spent the entire week. We get the call that our flight is boarding and we takes off around 8:45 PM. The return flight is quick as I don't get to finish watching my movie. Our flight lands in Cleveland around 11:20 PM and we're all dead tired. We stand around waiting for luggage and I ask the kids if they enjoyed their time in Canada, both of them said yes. The air is humid when we get out of the airport as I was getting to use to the cool crisp mountain air. It's a 30 minute drive back to Kim's house and we arrive and it's after midnight. The dogs are barking and are excited to see us. As expected her mom has stayed up and greets us. The kids immediately head to bed as they have to be up early in the morning. We settle in bed me and Kim start discussing our next adventure.